Deep in the body, the bone marrow and the thymus generate a dizzying arrange of cells specialised for immunity. These include cells that can destroy infected cells, cells that swallow pathogens and then display pieces of them for other cells to see, cells that monitor other cells for signs of cancer or infection, cells that make antibodies, and cells that carry antibodies. All of these cells, falling into an intricate arrangement of types and subtypes, interact in a series of baroque dances, their communication depending in part on the action of free-floating molecules. Chemical signals travel through the blood from sites of injury or infection, activated cells release substances to trigger inflammation, and helpful molecules poke holes in the membranes of microbes that deflate them. 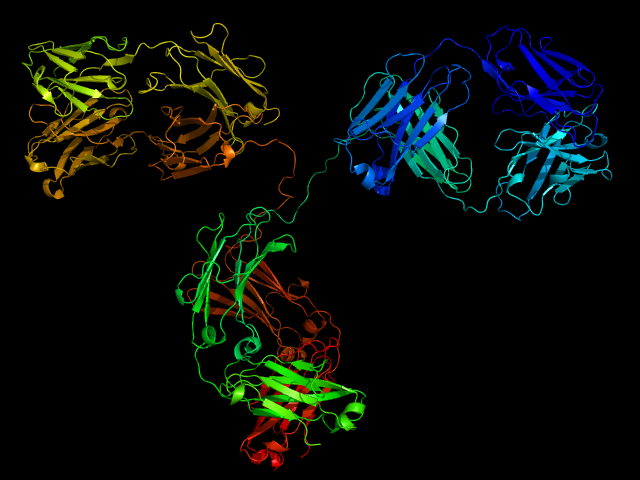 Image: model of Immunoglobulin G from here.